This is one of those times when I wish dogs could talk. WHY did you tear apart my new plant? You've been sharing the backyard with that plant for five days– why did you suddenly turn against it? That flower pot is really heavy... how did you even knock that over? Did both of you karate-chop the plant at once? I know I don't have kids, but I felt like the mom who returns to the room to find her two year old has used permanent marker all over her white kitchen cabinets. The other day I was discussing our paint color dilemma as we search for the perfect light grey for our main living spaces. I was hoping for a good estimate from the painters so that we wouldn't have to do all that painting ourselves (the husband really hates painting). Lucky us, they estimate was within the budget and we get to move forward with this big project! 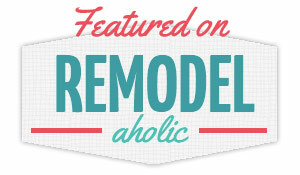 One company gave us an estimate of $1,600 for our paint job– which of course was a big fat NO. These painters agreed to paint our living room, dining room, office, hallway and one kitchen wall, with all trim, baseboards, crown moulding and doors included, for $500. SWEET deal! Plus they are going to patch a couple of small cracks in our walls, too. Let me just tell you, Scott was beyond excited that he won't have to do any painting. This is the first home improvement project we have ever hired out, and it's going to be nice to come home from work and have it be done already! Because Scott's schedule is crazy during football season and he would never have enough time at home to tackle a project this big, we couldn't have even talked about it until he had a holiday from school. We're taking a big trip over Thanksgiving, and we'll probably be traveling for Christmas, too. Who knows when we would have had the time or energy to tackle this huge painting project? Now we're actually getting it done NEXT WEEK! Yay! This means we really have to decide on a paint color before Wednesday, which is when they are starting the job. I did more online research and found that tons of people have used shades of grey from Benjamin Moore and are thrilled with the results. 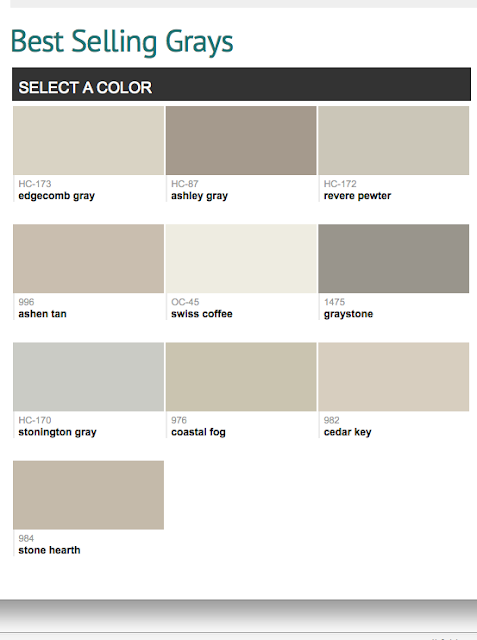 I visited the website and felt like Benjamin Moore greys have more warm undertones and don't really run the risk of looking blue. I'd rather err on the side of taupe (or greige) than paint everything a grey that can be confused with light blue. I think Revere Pewter is my favorite color from online browsing, but I'm hoping to pick up a few samples this weekend so I can see how they look in the space. It's the homecoming game for Scott's football team tonight, and I can't wait to be on mum-watch. 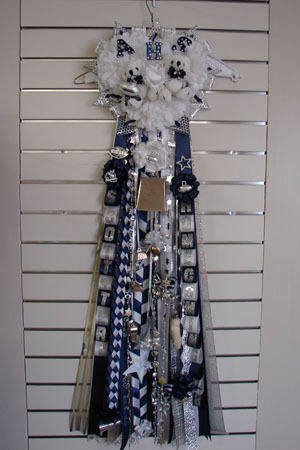 Not familiar with homecoming mums? They're a Texas tradition that involves draping yourself in ribbons, bells, mums and sometimes even teddy bears to declare your homecoming date. Usually one ribbon has your name, and the other has the name of your date. Everyone parades around in them during the homecoming game, and I'm sure they are wearing them today at school. Guys are responsible for buying their homecoming date a mum, and the girls have to buy the guys a mini-mum that they wear on their arm. Seniors normally wear white mums while all other classes wear mums in the school colors. They are completely ridiculous, and I love seeing which poor girl has to drape a homecoming mum around her neck the size of Texas and carry it around all day! I have seen a mum that covered the girl's entire body, feature two full-sized teddy bears and was lit up with Christmas lights! That poor girl probably had to visit the chiropractor the next day. Can you see why I'm excited to "mum-watch" at the football game tonight? It takes people watching to a whole new level!